The November episode of the FREE podcast “This Month in Eureka Recreation” is now available. Have you ever wondered what goes into putting together city wide community events, sports leagues and programs? Is our job really anything like the Parks & Recreation TV show? Well, now you can find out. This month, the last episode of the year, Ashley and Scott (and the newly unveiled “Silent Joe) share a few laughs together as they talk about the “Arts and Culture Festival”, rain, art and culture. This episode is a nice warm hug to Eureka. No spoilers, so we’ll see you in January. Listen to it on your computer here. You can subscribe on iTunes by following this link. You can listen on line at www.Cape-media.com, specifically at this page. Unsure what a podcast is? Go here. Want a quick overview on all your options and how to hear podcasts? Go here. It’s by Jona Kavanaugh and it’s located by amphitheater at Halvorsen Park. It’s a perfect bench to photograph for the Great Eureka Bench Crawl. To see all bench art posts, follow this link. We’re bringing the Scavenger Hunt back for the Arts and Culture Festival! It was one of our more popular events at Get Out and Play Day last July so we’re doing it again! Great Eureka Bench Crawl – Win a Prize! Would you like to win $50 to the Carter House Restaurant – for simply taking some pictures? So, help us celebrate the grand opening of the Waterfront Trail, and the installation of all the new artistic benches – and win a prize for doing so. 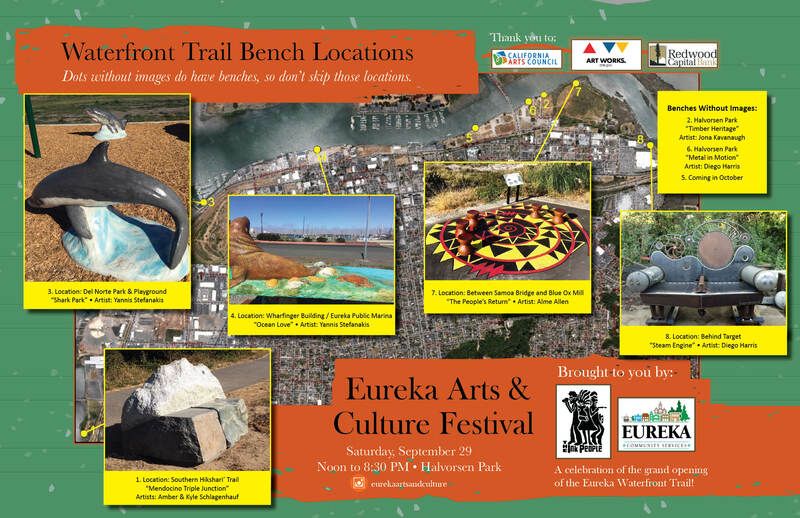 Continue reading Great Eureka Bench Crawl – Win a Prize! Posted on September 26, 2018 September 26, 2018 Author scottqmarcusCategories Announcements, Arts and Culture Festival, Bonnie Gool Dock, Halversen Park, Hikshari' Trail, Humboldt Bay, Humboldt Waterfront, waterfront trailTags Arts and Culture Festival, bench art, contest, family events, free event, oct2018, sep2018, special announcement, special events1 Comment on Great Eureka Bench Crawl – Win a Prize! 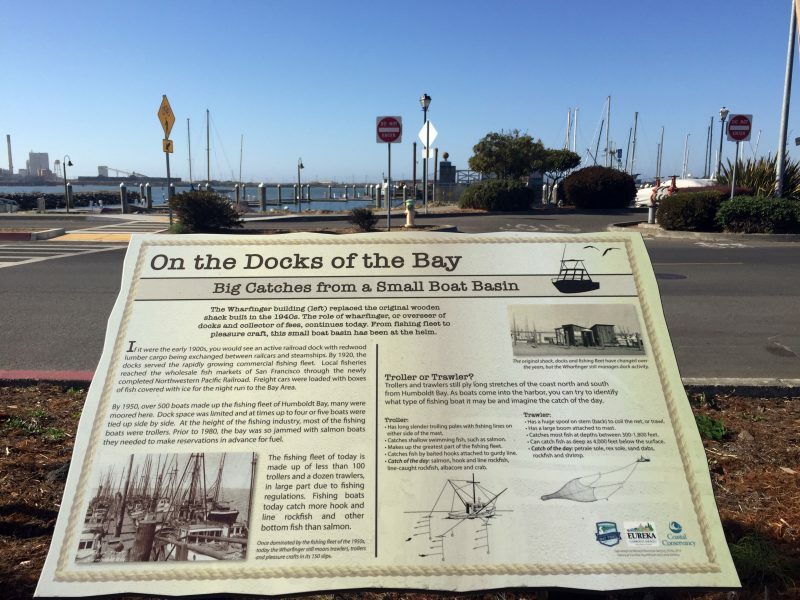 The Waterfront Trail’s new interpretive signs are being put in place! 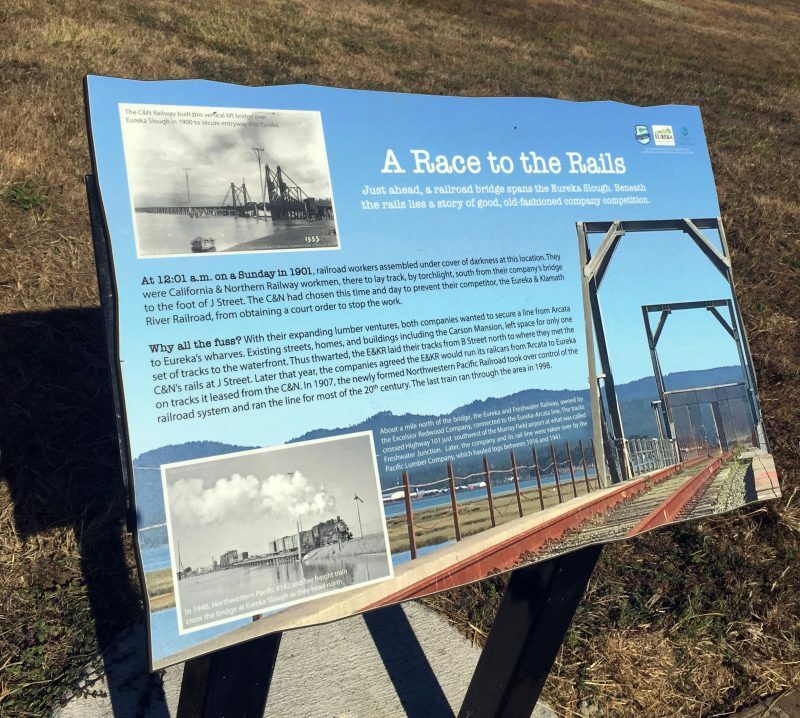 As we get ready for this Saturday’s big event, folks have been diligently putting up signs along the trail to give you a better understanding of the history of our area. Shown are just a couple of them. Meet Diego and hear about how he created two unique pieces. Diego harris is one of our six artists commissioned to create artistic interactive benches for the Eureka Waterfront Trail. He will be discussing both of the pieces he has created. Hear about how he created an unique piece representing our local railroad industry. Hear about how he created a unique Kinetic themed piece. There’s another new bench on the Hikashari Trail! Kyle and Amber Schlagenhauf have designed and set up the “Mendocino Triple Junction Bench” on the southern part of the Hikshari Trail. See below for exclusive information, video, and pictures.